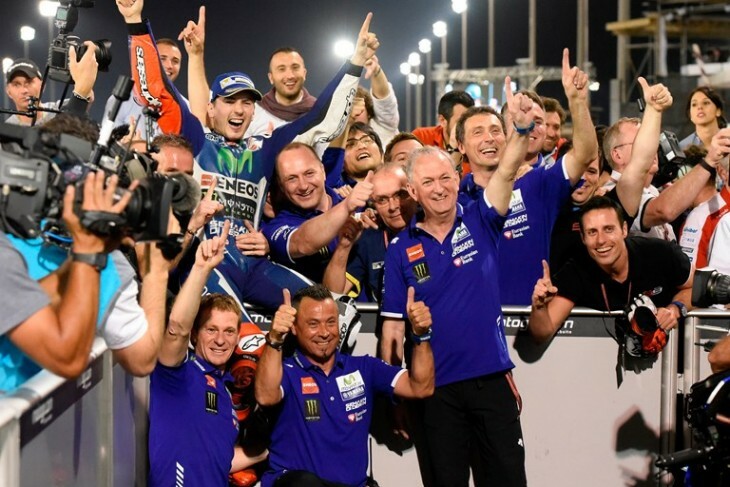 Movistar Yamaha MotoGP’s Jorge Lorenzo kick started the 2016 MotoGP season tonight with a masterful victory at the Commercial Bank Grand Prix of Qatar. Teammate Valentino Rossi also put on an impressive performance during the opening round at the Losail International Circuit, finishing in fourth place. Movistar Yamaha MotoGP’s Jorge Lorenzo had been strong at the Losail International Circuit the whole weekend and the race day was no exception. He rode a faultless race from start to finish, and brought home the first win of the season. Teammate Valentino Rossi also put in a strong result at the opening round of the 2016 MotoGP season, missing out on a place on the podium by just a tenth of a second. Lorenzo’s race went according to plan at the start of the opening race when he had a perfect launch off the line from pole position. He led for the first lap, but was chased by Andrea Iannone and Andrea Dovizioso on the over one kilometre long straight at the Qatar track. The Spaniard was forced to let them pass, but he didn’t give up. As his rivals battled each other he lay in wait and after Iannone crashed out the Yamaha rider took his chance to make a charge for the lead for the second time. With 14 laps to go, he smoothly passed Dovizioso and continued to increase his pace. With clear a track in front of him, the Majorcan was in his element. In an effort to shake off Dovizioso completely, he used the nimble YZR-M1 to the fullest, setting a new fastest race lap record of 1’54.927s. He slowly inched away and crossed the line for the final time with a +2.019s lead over the man in second place. Starting from fifth on the grid, teammate Rossi had a good start and made sure he placed himself close to the front, in fourth place, to stay in contention. He shadowed his teammate as the top five formed the leading group, but couldn’t find a way through. With rival Marc Marquez pushing him down one place with 20 laps to go, the Doctor used his experience and bided his time, hoping he could benefit from his harder option rear tyre towards the end of the race. His strategy paid off when the rivals in front of him got involved in a scrap, causing Iannone to crash out. Now in fourth, he put pressure on Marquez by setting multiple personal best laps of the race, as he didn’t want to let Dovizioso and Lorenzo pull away. As the top three upped their pace towards the end of the race, the Doctor kept pushing to the maximum and set the fastest lap of the race thus far, trying to hang on to the back of Marquez. The battle for second between Dovizioso and Marquez lasted until the final corner, giving Rossi a chance of reaching the podium, but he came just short and took the flag in fourth place, +2.387s from his teammate. Lorenzo’s masterful win earns him first place in the championship standings with 25 points. Rossi now holds fourth place in the championship with 13 points. Thanks to today’s results Movistar Yamaha MotoGP take the lead in the teams’ championship with 38 points. The next round will be held at the Termas de Río Hondo Circuit, Argentina, in two weeks’ time. Monster Yamaha Tech3 Team rider Pol Espargaro kicked off the 2016 MotoGP season with a positive finish of 7th after a challenging race. The young Spaniard shot off the starting grid from 9th position and after a frantic first lap, he crossed the line two places back. From here, the resolute 25 year old stuck into his formidable race pace as he looked to climb through the competitive field. By lap six he had closed down and passed his teammate whilst he continued riding consistent times before overtaking Hector Barbera for 7th at the halfway point. Espargaro pushed onwards, yet in the final seven laps he suffered with visor issues and had difficulty seeing, but he persevered and diced with his teammate right up to the chequered flag. Eventually, he crossed the line in front, clinching the top independent position. On the other side of the pit box, Bradley Smith delivered a notable performance today after completing the race just a blink of an eye behind his teammate by only 0.023 of a second. The young British rider began the sprint from 11th, but moved up one place by the end of the first lap. Then, he quickly locked into his race pace and homed in on the positions in front. By the mid point, Smith was in 9th and remained with Espargaro as the race distance progressed. On the final lap, the pair exchanged passes, with the British star finishing right behind his teammate by a hair’s breadth. His effort today strongly outlines his desire to win the leading satellite honours which he will fight for again at the next Grand Prix in Argentina.